Slicing observation WORKSTATION. Stereo pairs glass slides, close circuit TV, microscopic video, KP dust sample. Top image is from the live culture that was created from dust collected from the Porter’s biological archives cabinet that had not been opened for over 20 years. Media artists, Stephen Bradley and Kathy Marmor mined the UMBC archive of Keith Porter, the ‘Father of Cell Biology’ to collaboratively produce The Glass Knife, an installation of sculptures that illuminated Porter’s groundbreaking research, and celebrated a revolutionary vision, mediated by technology, which extends our seeing. What is the glass knife? 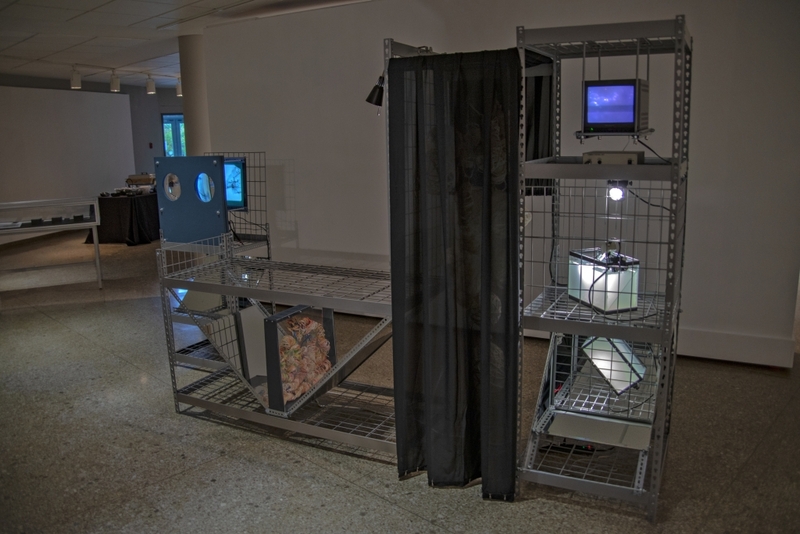 Background image is from the “Live Culture TV” component of the surface of a growing culture that samples the gallery air space for mold spores. More info: here.More information about the Glass Knife can be found here. Photographic documentation in this post represents one of Bradley’s contribution to the project. 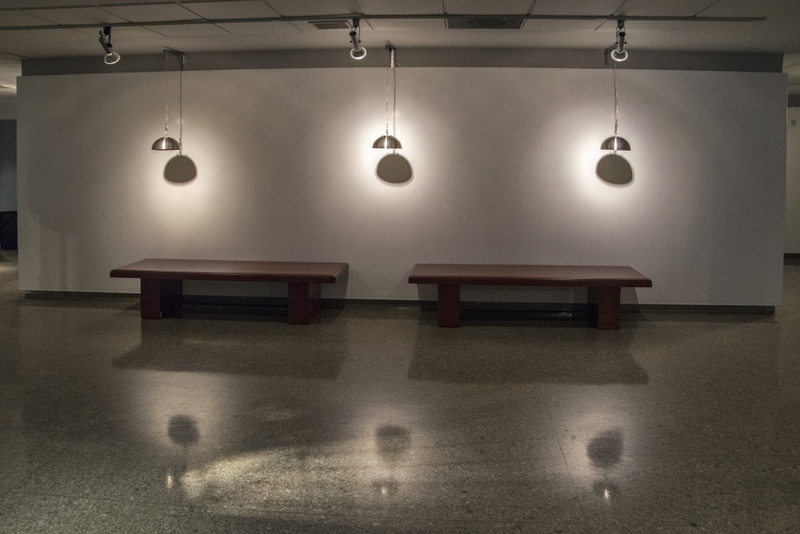 Project supported by a generous grant from Special Collections, Albin O. Kuhn Library Gallery and Keith Porter Imaging Facility, named after the Biology scientist who was in residence at UMBC in the late 70s. 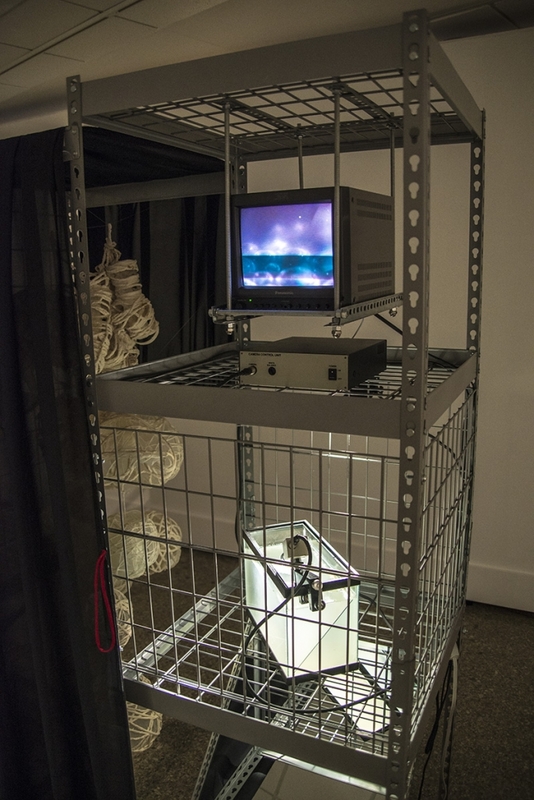 Live close circuit TV with aquarium, dust sample, broth, found slime mold, microscopic camera, structural hardware, and computer. 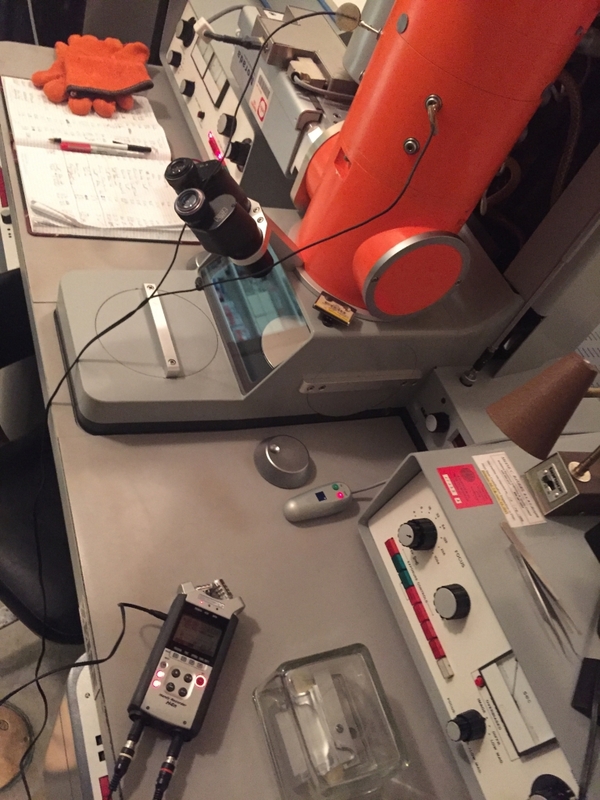 Documentation of recoding the sounds of an operational electron microscope that Keith Porter used while he was at UMBC in the 1980s. Keith Porter Imaging Facility, UMBC. (VLF) Electron Microscope. Multi-channel sound installation, 3 DIY parabolic speakers, mp3 players, amplifier. Sound composition was created by using a very-low frequency (VLF) receiver that listens to electromagnetic signals, which the electron microscope emits. 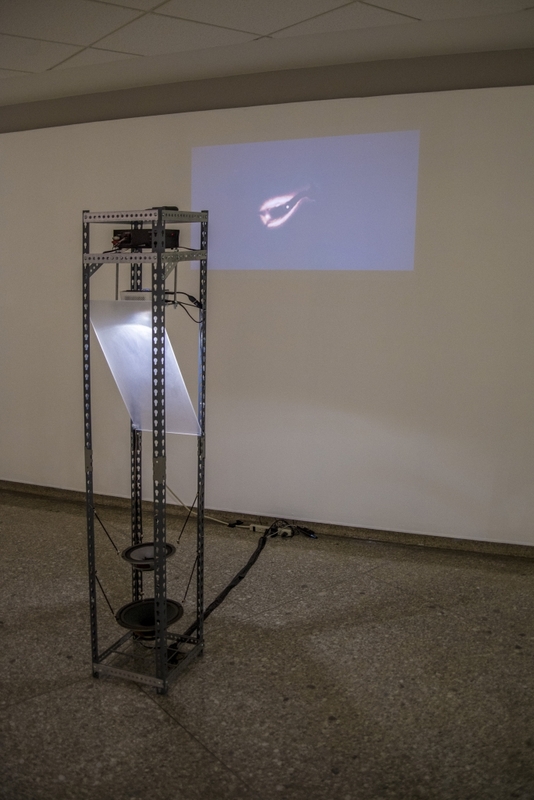 The next piece, Magnetic Cell was conceptualized and constructed considering the sonic and metaphoric structure of the electron microscope that was used in the 1970s. 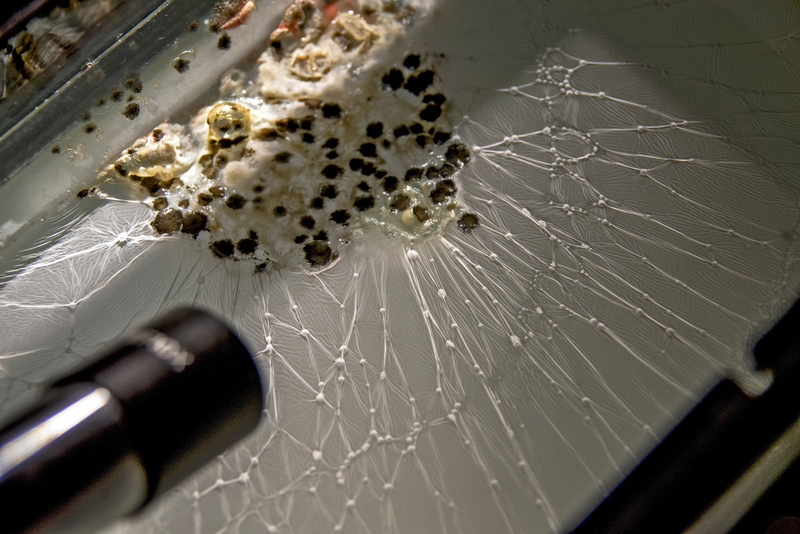 The sounds are from a working electron microscope employing air microphones and VLF receiver while imaging an organism at the Keith Porter Imaging Facility May 2016. One speaker was dedicated to the mid-range frequencies and the second one dedicated to the bass sounds. The colorized film portion of the installation was created by Dr. Keith Porter and his collaborator at University of Colorado Boulder in 1972. At the time it was rare to be able to film one celled organisms while it was alive. The film can be seen by following Dr. J. W. Shay / Keith Porter film – electro magnetic cell.